← Okay, "Hunger Games" Is No "Harry Potter"……. We're No. 1! We're No. 1! Who was America’s only chief executive never elected as president or vice president? Offering the correct answer of Gerald Ford, Morgan State University captured the 23rd Annual Honda Campus All-Star Challenge in Los Angeles, besting 48 teams from historically black colleges and universities around the country. It is the first title for the Bears in the annual academic quiz challenge, and brings Morgan the grand prize of $50,000 in institutional grants. “This is everybody’s first year on the team, and to try to figure out how to meld what they know with what they need to know, takes a journey that builds a relationship of trust. It’s been a beautiful relationship with my team,” said Dr. OluwaTosin Adegbola, coach of the Morgan HCASC Team. Morgan defeated Oakwood University in the final round, and outlasted Florida A&M University and Morehouse College in the final four. The MSU team was comprised of Craig Cornish (Captain), junior, History Major; Micheal Osikomaiya, sophomore, English Major; John-Paul Stephens, freshman, Screen Writing & Animation Major; and James Hayes-Barber, freshman, Electrical Engineering Major. 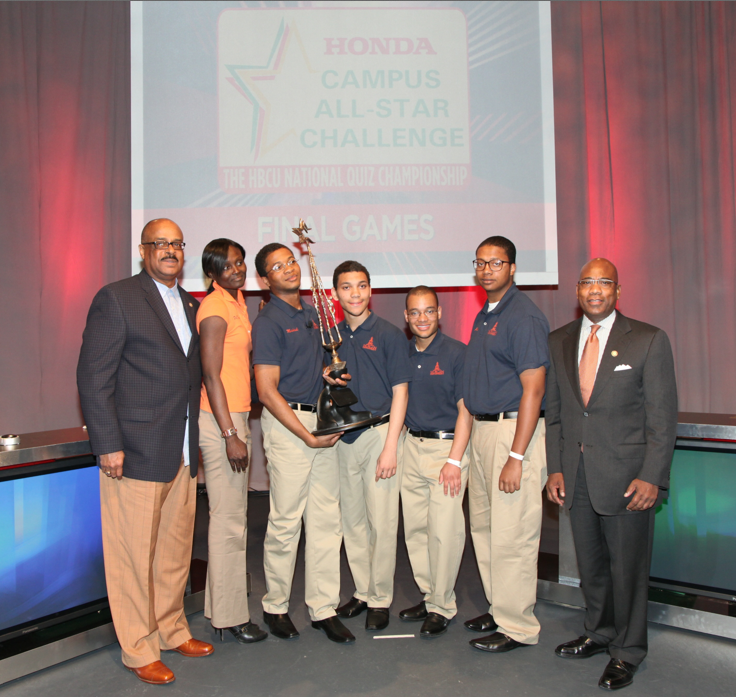 Morgan State University brings home the first place trophy as champion of the Honda Campus All Star Challenge. Although Morgan has been among the finalists in past competitions, this is the first year that Team Morgan has emerged from this national academic competition with a first place win. The two-day tournament ended yesterday in the Los Angeles area and included 250 of the best and brightest students from Historically Black Colleges and Universities around the country. Other finalists in the competition were Oakwood University, Florida A&M, Morehouse, Alabama State, North Carolina A&T, Stillman and Southern University – New Orleans.Morgan congratulates its winning team: Captain Craig Cornish (junior); Michael Osikomaiya (sophomore); and, freshmen James Hayes Barber and John-Paul Stephens. We also celebrate Dr. OluwaTosin Adegbola, who served as team coach again this year. Team Captain Craig Cornish calls bonding with his teammates and coach his favorite part of being on Team Morgan. “There have been a lot of incendiary moments, but they’ve made us stronger. I’m looking forward to getting ready for next year,” says Cornish, a junior majoring in History. The winning school brings home $50,000 for the University. What was the winning question for Team Morgan, you wonder? Congratulations, again, to Morgan State’s team for winning the Honda Campus All-Star Challenge Team. Congratulations professor, and congratulations Morgan State U. Honda Challenge team.